You’ve started writing before. You’ve even had inspired spurts, where the writing feels productive, like it’s going somewhere. You get excited because you can see the potential in your own writing, it could become an actual book, someday! Then, you hit a wall. For some, the wall comes up early, within a few hours of starting or re-starting a project. For others, the wall comes up late, about half-way through the manuscript. For the unfortunate few, the wall comes up repeatedly and often. Regardless, the wall usually does come up and makes writing feel impossible. You lose sight of the purpose of your writing. You suddenly start judging your words quite harshly, thinking that you’ve not said anything original or worthwhile. And the urge to stop writing is irresistible. So, you give yourself a break. You say to yourself, “Maybe I just need some time away. I’ll take a break and come back to it.” But even days, weeks, months, or years later, you come back to it, and the wall’s still there. What can you do to get around this wall and find that excitement in your writing again? How to get over writer’s block? Change your perspective on your writing. The wall is an illusion. The wall feels so firm and real, and the writing feels so faint and distance, but it’s all in your imagination. Your writing has just as much potential as it always did. You’ve simply changed the way you’re looking at it. So, how do you switch your perspective to see your writing in that exciting, possible way again? When I think of writers who know how to get over writer’s block, they are the ones who know how to question the wall that comes up in front of them. When confronted with a question, our brains will instinctively kick back an answer, and that answer can be very insightful as to what is really causing us to see this wall between us and our writing. Honestly, as a writing coach, the most effective thing I can do for you and your writing is to ask questions to help you change your own perspective on your writing. If you feel like there’s an insurmountable wall between you and your writing (or you can feel a wall starting to come up), here are some of the best questions you can ask yourself about your writing. How many hours per week do you set aside for writing? Why is this writing important to you? How do you think this writing could change someone else’s life? What do you think is the biggest struggle you’re experiencing with the writing right now? What’s one thing in your life, that if it changed in some way, would make writing easier for you? Don’t just think your way through these questions. In order to force your brain to answer them, you’ve got to talk out or write out your answers. Find an accountability partner to meet over coffee (let the person know you’d like their help sorting out your writing block with these questions) or find 30 minutes to write out your answers to these questions. Within the answers to your question, find your next action step. You need to change something about your writing routine. Maybe it’s something simple, like writing at a different time or location. But maybe it’s something more complicated, like changing the entire focus of your writing project. But something has to change. Once you find that one thing, you’ll feel an internal shift, a lightening, and that wall will suddenly vanish. The excitement to write will rush back in, and you’ll be free and clear to re-start your writing project with a fresh batch of energy. And know that the next time that wall appears, you’ll be ready to ask the right questions that reveal the wall for the illusion that it is and launches you back into writing productivity. 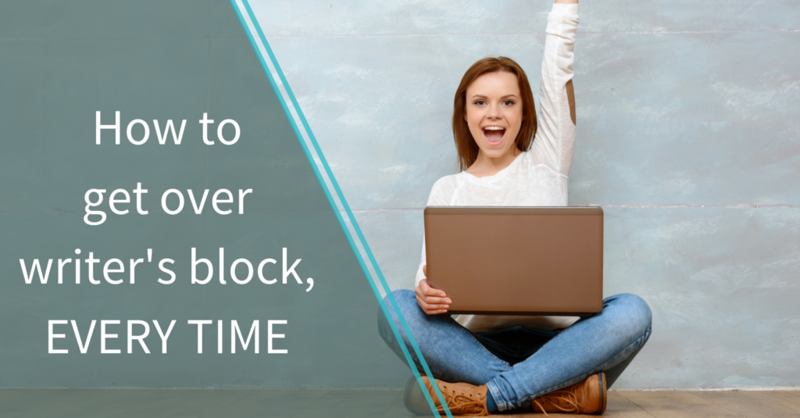 You’ll know how to get over writer’s block, every time. What about you? Do you have any intuitive nudges about what might need to change in your life to bring that wall down and let the energy for your writing come back in?